OMG Posters! 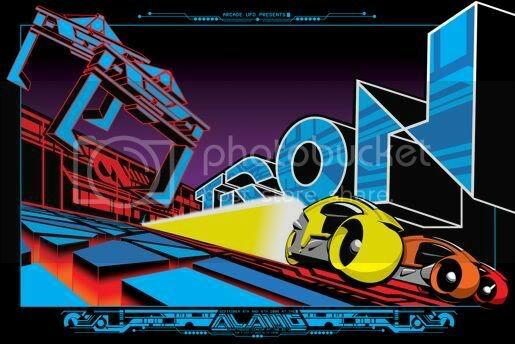 » Archive Brad Klausen's Tron Poster - OMG Posters! Just when you thought it’d be a slow weekend, here’s another great Alamo Drafthouse poster. This time it’s Brad Klausen’s print for the upcoming screening of Tron. This one is a 24″ x 36″, nine color screenprint (with glow in the dark). This is the most colors ever on an Alamo poster. The price is $45. If you want one of these hurry over, as they will disappear forever on Monday at noon CST. Visit Mondotees.com. Love this! I’ve been waiting to see it since I heard that Tron was on the roster. How long did it take to sell out? These went up sometime on the 30th and were gone by midnight CDT on the 31st; it couldn’t have taken more than 36 hours for them to sell out. From what I’ve heard, Mondotees had 150 of these. Amazing. Too bad I missed it.